As promised by Capcom, the NES game Mega Man 4 is now available for $4.99 on the Nintendo 3DS Virtual Console in North America. Next up, Mega Man 5 sometime in May. Trust me, you're not missing anything. In case anyone's wondering, no, this doesn't have anything to do with me being biased against Mega Man 2; it has more to do with the fact that the 3D feature is completely useless. I'd be saying the same thing if 3D versions of Mega Man 1, 3, 4, 5, or 6 were being sold. Huh ? Whatever happen to Megaman 6 and Rockman X3 for Wii VC ? Sighing. While I can agree the 3D feature is "completely useless," it would at least give some incentive for being available on the 3DS. I'm tired of straight up ports. Besides, if you don't like the 3D, it can easily be switched off! Same with Anon #2: I want MM6&7 and X3 on my Wii U for recording purposes. Really DO NOT want to resort to emulators. I'd rather create my videos from console footage and only use emulators when it is needed. Finally. This might me the last one I get for a while. MM4 has always been my favorite of the NES games. Though I might pick up 5 and 6 if Capcom hints that supporting these will get us more portable Megaman. MM9 and 10 please. 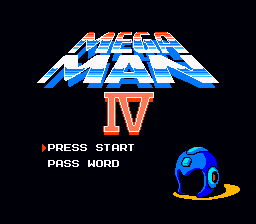 Megaman 4 was my first Megaman game, and my favorite to this day. I still don't understand how people can think 2 is the peak of Megaman's gameplay. 4 is so much more fun to play, at least in my opinion. It's hopeless, but I wish MMX-MMX5 were on the 3DS in some capacity.